Since returning to railway modelling a couple of years ago I’ve been trying (albeit not very hard!) 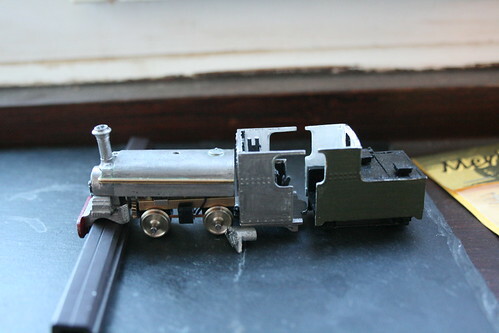 to work out the best way of giving my old 009 model of the Penhryn/Ffestiniog loco Blanche prototypical outside frames. The original build was a Parkside Dundas kit using the venerable N gauge Ibertren Cuckoo chassis, which was a very handy unit for making small 009 locos feasible but with the drawback that most locos of that size really need to wear their frames on the outside to look right. The later Backwoods Miniatures kit was a complete product with the correct chassis arrangement. The initial plan was to either replace the axles in the Cuckoo chassis with longer ones, or graft on extensions – the typical way to do this in 009 is to add overlays to the wheels with stub axles attached. Neither of these were perfect as the mechanism is notoriously noisy (past life as a coffee grinder?) and the add-ons would be difficult to produce and align accurately. However I got as far as stripping down the chassis to the basic block as most of it would get in the way of the new frames. Progress then stalled until a few weeks ago, when it occurred to me that it might be possible to fit a Bullant motor bogie in the saddle tank. Blanche is a fair bit bigger than the ‘typical’ quarry Hunslet with the tank especially being set quite high. A quick experiment with a mechanism I had to hand confirmed that with a little fettling of the saddle tank casting it should work. I could order a new Bullant, with extended axles, and a further benefit would be that I could now get an accurate wheelbase and size as well – in this case 20mm (5′) wheelbase and 8.7 (2’2″ nominal) wheels – the old Cuckoo was under length with smaller wheels. These are the major components of the kit, with the new mechanism in the background. With a Mashima 1015 and a nice big flywheel it will hopefully run significantly better than its predecessor. 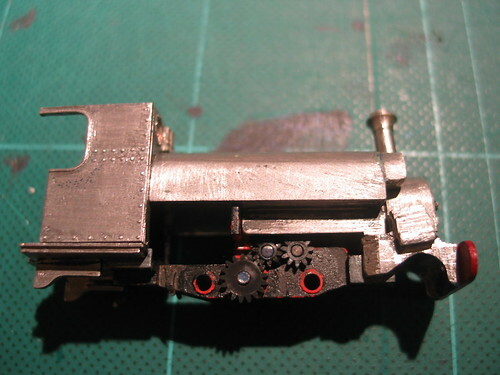 It will also free up room in the firebox to potentially add a DCC chip later on. The kit was designed to be mounted on the flat parts of the Ibertren chassis, so one of the challenges here will be figuring out an appropriate way to mount the body on the Bullant. My initial thought is to add some cross-pieces to the ‘spine’ of the mechanism under the motor and flywheel to create a sub frame that the body will sit on. Just to show that the Bullant does fit in the saddle tank here are the components posed together. 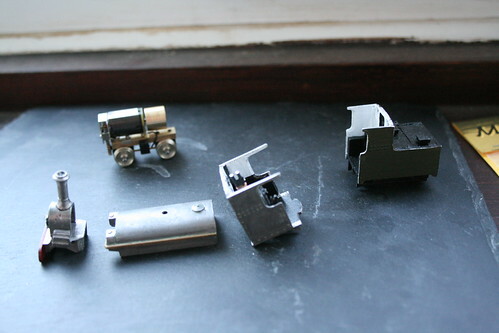 I will need to make longer coupling rods to suit the new wheelbase, and the connecting rods may need to be replaced too. With the kind assistance of a forum member I hope to be able to produce these in nickel silver using a pantograph. Otherwise almost all the parts from the kit can be re-used. I’m intending to add further detailing (mostly pipes!) to bring the whole thing closer to the current preserved condition of the loco. 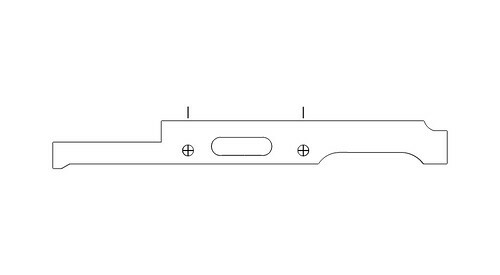 Working from scale drawings I’ve drawn an initial visualisation of the new outside frames. I’ll cut these out in plasticard soon to confirm the shape is right and that everything will fit together properly. The real thing has distinctive cut-outs between the coupled wheels so it should be possible to make a representation of the ‘gubbins’ visible behind. So if anyone would like the ruins of an old Ibertren chassis to repair, let me know! This entry was posted in 009, blanche, bullant, chassis, kits, model railways, narrow gauge. Bookmark the permalink.